From the author of the international bestseller The Four Agreements comes a profound guide which grounds itself further in the tradition of Toltec wisdom, helping us find and use the hidden power within us to achieve our fullest and most authentic lives. Delving deeper into Native American practice, Don Miguel Ruiz confronts us with three simple, yet utterly profound questions which are essential to explore at each stage of our lives: * Who am I? * What is real? * How do I express love? 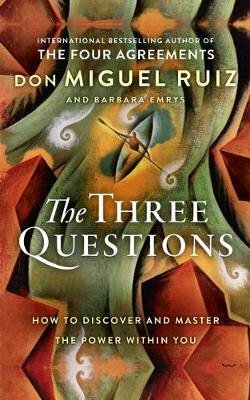 Through these three eternal questions, Ruiz offers a practical framework to eventually lead us to our most complete and truest of selves. His transformative message provides the reader with a vehicle for overcoming stress, fear and anxiety, achieving peace of mind. This significant and empowering book reveals how our power is actually rooted in our identity, and it is only when this realisation hits that we will begin to be a benefit to ourselves and others. A fascinating exploration on spirituality and human identity, The Three Questions is essential reading for those who are in pursuit of self-knowledge, understanding and acceptance.